kanzenryu: This time we should at least get one corner. Antone: sounds like a plan :-) shall we start immediately or wait for a few more players ? kanzenryu: We might as well get started with suggestions while we try to attract players to the game. kanzenryu: Holy cow, I was on the winning side for once! Sec? : Yay, we won. Thanks for all that good cooperation. JeanHebert? : R8 (b). I think we can block directly without too much trouble. Sec? : P8 (c). I'm not sure if this works, but a more aggressive alternative. Dieter will act as Black captain if no one objects, and picks b. There is no apparent danger. Black is ahead and there is no need to make the game complex. JeanHebert? : R16 (c) is also pretty big. Bacteria picks C2 (a). I think I mentioned the order of moves in endgame before. This move isn't double sente, but it's a huge amount of points and sente. Bacteria picks P2(a). Only move. Jeanhebert: O5 (b). We need to remove our aji here before trying to do something like a.
fractic: L8 (d). I still like this move. jasavol1: Someone suggested earlier K9 (e). looking for aji around s,t i couldn't find anything good, maybe somebody else could take a look at it? Bacteria picks g. This move is sente and looks big. In the endgame, the order is usually double sente>sente>reverse sente>gote. Reuven, I thought a soldier is only allowed to make one suggestion for each move. | Reuven: Oh, even when there's almost no activity? Captains having no choice makes it a little boring, I'd think? kanzenryu: P6 (a) defend our two stones against attack and prevent his stones from linking up. Let's try to pick up the pace in this game! JeanHebert? : O5 (b). This leaves less aji. I am not 100% sure Q6 can't connect though. And yes, it would be nice to be able to finish this game before we die. jasavol1: (c). We should afford to tenuki, right? Sec: R16 (d). If we tenuki, I like that one. fractic: L8 (e). Start a fight in the center to make use of the cut we just played. Bacteria picks c. This move is double sente and it is worth many points. We can fight in the bottom right side later, but I think this is bigger and we do not have to defend immidiately. Andy: a (B11) and b (S5) both look like double sente. It would be nice to get both. How about we start with a (B11)? TH: d- I wanted to put this in the consciousness for once the sente moves are exhausted... ends in gote (or worse if my reading is off). jasavol1: Attack those two poor white stones by playing e (M9). Pashley: f, Q5 block the connection planning to attack on one side or the other eventually. Sec: I really like a, but to add my suggestion: I like g (N9) more than e.
Bacteria picks f. This move makes S4 a huge endgame, and it also threatens to capture the two stones. If we attack the two stones now, they can sacrifice the stones and just reduce the territory easily by connecting to the outside. JeanHebert? : R16 (b), blocking the other way. Andy: B11 (c) for mutual damage, but I think a is correct, particularly if we are ahead. fractic: I think the largest point besides the top right is C3 (d). However, allowing white at a would be too painful. Therefore I think a is correct. If white plays R16 we'll have to play Q16 too but that leaves white with a cut. I'd rather play b and take sente after white defends however that leaves white with the kosumi at T15 which is very big. Pashley: If we want mutual damage, d gives a sure profit and there are follow-ups that do more. But what about e? Uberdude picks a (s15). Bit annoying to let white get this in sente, but it is bigger than c3. JeanHebert? : I'll go with the obvious-looking P10 (a). Andy: I agree with (a), but if want to get greedy and ask for trouble we could consider N9 (b). Uberdude picks P10. Only move, or we get a broken shape. Andy: While it's tempting to just take the big point a (C3), I'm going to suggest accepting the gift as offered with b (N8). JeanHebert? : I will propose Q5 (c), as I am pretty sure White cannot connect O9 to the left. fractic: I'll go with M9 (d). White is challenging us to a fight but with the move at S4 in reserve I think we have better chances in the fight. kanzenryu: O10 (e) is the sort of cowardly nonsense I would play in a real game. jasavol1: Cut at K9 (f). Sec: My first thought was also (e), I don't think it's that bad. Uberdude: Do you think we can capture this stone? Or is there a way we can keep the big territory above and get sente to play c3? Pashley: To me, d seems the obvious choice. In terms of defending territory, it is strong, being both connected and a contact play. In terms of attacking his o9 and q6, it is also good, being a somewhat distant play that threatens W's connections. Among the non-obvious moves, I like h better than e and b; it seems to give better shape and a bit of influence toward the upper right corner. Bacteria picks O10 (e). We need to defend our territory. If we choose to fight, if white lives in our territory we will lose the game. H does not give us as much territory as e, and even if white gets the wall, they don't get much territory. Pashley to Bacteria: At one point, you suggested n9. I'd be interested in why you withdrew that suggestion. Was it just because you were changing roles so you could chose moves but no longer suggest? Or was that move flawed somehow? Uberdude: Apologies for not choosing a move earlier, I had hoped someone (e.g. fractic) suggested s4 as an answer to white 76. It's maybe enough to win the game, but defending at O10 seems rather too passive to me. The idea of s4 is to probe white's plan. If they go for the sequence where they get corner profit but we cut off the outside stone in sente then we don't need to defend our territory at O10, but can rather play at M9 or N8 to swallow up on a large scale. If white ignores s4 to jump in at O11 we can play s3 which takes away white's base. That group then has to run, and in the process we will get a stone around o7 in sente on that group and can then enclose at N8 to kill and the extra free prisoner white has generously given us by jumping in further at O11. This is the most effective way to use the thickness of the wall above and m10. Uberdude: kanzenryu, if we r17 and then white q16, what is your plan? @Uberdude no plan, sigh. Andy: D2 (b). I was hoping w would G6 instead of F6, so that we could F4 in sente. In a sense the lower left and upper right corners are miai, but I think the lower left is bigger, so lets take a piece of that. We could invade at C3, but then white will drive a spike down and make our F3 stone weak. JeanHebert? : K9 (c). If I missed nothing, this give a pretty good result in the middle. And as Andy pointed, since the two corners are almost miai, there is no need to play in them right now. fractic: Wow, it's been a while since I've had time to seriously look at this game, but I'm back! I'm going to suggest S4 (d) with the following reasoning. Uberdude: Nice sequence fractic! But I fear even after sealing the corner in sente, it is hard to enclose points in the middle (and we lost points in the corner in order to seal). What would you play afterwards if white did follow variation 2a as I expect? fractic: The idea was to consider the lower left and upper right corner as miai (even though the lower left is proabably bigger), and first see how white responds in the lower right. I think sequence 2a is the most likely as well. If this happens my suggestion for trying to do something with the center would be to play L8. If White draws back we play M8 and our territory in the center is not small. Of course White is unlikely to back down but as far as I can read the fighting looks OK for us. Uberdude picks d2 (b). Agreed that the lower left is bigger than the upper right. 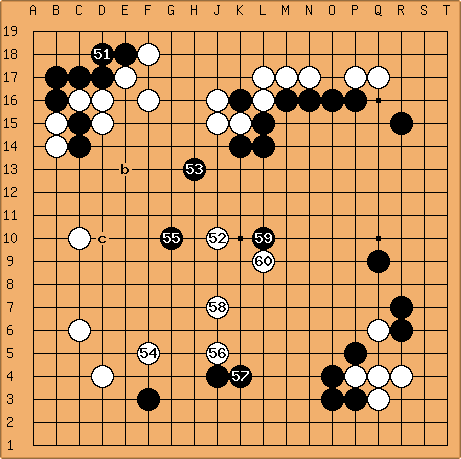 I think white will answer this at c3, as to allow us to play there is so big (but maybe kiai means white will tenuki). This way we expand our lower territory in sente (forestalling a white kick at e3). Invasion at c3 is also possible but it damages our lower side and I don't think we need such a big invasion to win. Of course after d2 c3 the push/block at c2 is very big (something like 18 points gote), but is slightly more sente for black so we should get that too fairly early in the endgame. After d2 c3 fractic's sequence to grow our middle right area looks appealing. But I didn't choose it yet as althought sequence 2a is sente, to justify the loss of points on the edge we then need to take gote to makes some points in the middle with L8. Then had we not d2, white could kick at e3 to make a gain in sente. fractic: If white blocks at then we can pull back and after either at a or b then at c will threaten the corner. This way we either get sente with good endgame benefit or get to chase a weak white group out. fractic: In this varation we seal the white corner in sente. fractic: This doesn't look any better for white. is substantial profit and the white group is uncomfortable. White will likely want to add a move. Andy: G5 (a). Just keep going I suppose. kanzenryu: K5 (b) get a strong bend while making a threat. TH: (ddk rank) I thought black would play at san-san (c), then didn't, and I still think it's the biggest point on the board. So I'm choosing sides just to suggest this move. I think we should be able to end in sente after threatening to undercut C6. Uberdude picks G5 (a). Yup, keep going. If we play k5 and white connects then that would indeed by a nice bend in sente, but the problem is white will likely resist and play g5, we take, and then white has sente to play a large point. TH, san-san is indeed huge, but now that we have started making these exchanges I think it is important to keep going before san-san. jasavol1: D2 (a) is quite big, isn't it? Andy: J5 (b). D2 is big, but I like patching our weakness in sente. If white exchanges by pushing through at G4 we still have options in the lower left corner. JeanHebert? : Although I am in favor of b, let me add another big point: Q5 (c). Andy: a (B10). We can make some sabaki here, using the aji of the nearby black stones. JeanHebert? : What about C12 (c)? Uberdude picks c12 (c). This defends against white pulling out the two stones, and has a follow up at e11 if w ignores. If w defends at e11 we get sente to play a big point elsewhere. 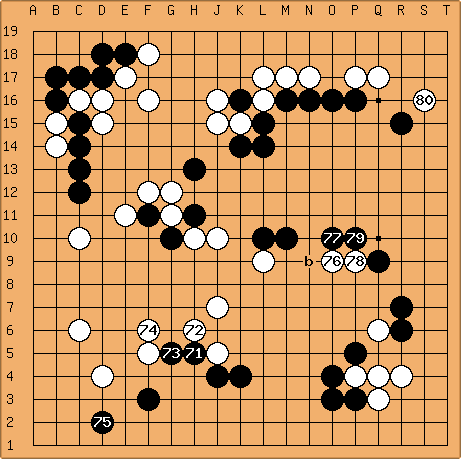 The problem with b11 is it lets white get c11 in sente which means they don't need to spend a move to protect at e11. Andy: G13 (b) is the driving tesuji. JeanHebert? : C13 (d). Let's bring some friends into the fight. jasavol1: I wonder if we should connect our two stones by playing E10, F10, or F9. If we don't play there, white may play F10 threatening to capture G10 (even before we could capture and ). But I don't have a suggestion left for this move. Anyone? Andy: if we connect the stones then they are heavy and we have to save them all. White can G13/F13 to connect . I think is already connected. That means we would have to kill (C10) or all the black stones on the left die. I don't think we can do it, so I'd rather keep the option of abandoning one of the /G10 stones. Uberdude: The move I would like to play has not been suggested yet, though many nearby moves have. The important thing here is to stop white getting the entire left side. We cannot capture white's G10 stone. However, we can threaten to do so and make it so that in saving those stones white helps us to live. Remember to trap stones it is often a good idea to back off a little and surround from a distance. The driving tesuji at g13 is not good here as white just happily answers at f12 f13 e12 and takes the entire left side. h12 and g11 save 63 which is not a useful stone: it doesn't matter if it is captured. The stone we want to save is 65 as this is on the left side. Sec? ; what about g? Connect our poor stones. Uberdude picks C13 (d). If w answers this maybe we can do something better in the fight, if w ignores at least we get something on the left side. jasavol1: I'm not sure about what is going to happen in the next few moves, but IF we are going to lose our G10 stone anyway, we can play G12 (b) in sente; after that we can play any other point we want to. Andy: C13 (c). Pull these stones out. Sec? : (d) help our weakest stone. JeanHebert? : F11 (e). Another possible move for that crosscut. Uberdude: In this sort of complex fighting reading is key. For example I think f11 is a good move, but only if the next move is correct. If the next move is wrong it is a disaster. What is our goal in this fight, and what sequences allow us to accomplish this? Andy: Usual would be to look at the driving tesuji. bF11,wG12,bG13. Then if wH12 black can squeeze with bJ12. If white turns the other way at wF12 black can set up a loose ladder that rescues the C14/15 stones, but is it enough for black? jasavol1: Maybe we could continue pushing from the left with bF11, wG12, bF12. But I'm not sure if it's good or not. If white continues with wG13, we can still play bF13 in sente. We would have acquired some influence on the left side (without any definite eyespace, though) but, at the same time, hurt our stones at H13 and H11. Or is it that after a wall in F11, F12, and F13, we would be able to capture the stones in b14 and b15 unambiguously? In that case, the wall would be cool, wouldn't it? Uberdude picks f11 (e). Argh! jasavol1: I have no idea, but I vote for H11 (a). Andy: K7 (b). Counter-attachment. Black extended solidly with and . We have to use these stones to fight for the center now. (b) threatens to either break into the middle-left or to wall off the middle right. If wK6, bJ8 wK8 bK9. If wK8, bJ8 with similar outcomes. JeanHebert? : K9 (d). No need to follow white. Antone: F13 for a different trade ? Uberdude picks H11 (a). This is pretty much the only move to me. We can't tenuki or else g10 dies on a big scale and w gets loads on the left. jasavol1: We should be able to hane at M9 (b), shouldn't we? Andy: J9 (c). I think we are strong enough locally for this. 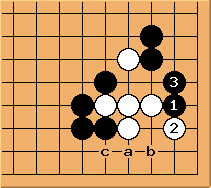 (a) and (b) both encourage white to get strong in the center, which weakens G10 and H13. JeanHebert? : I was going to propose K9. Let's add the other keima cut: K10 (e). Andy: I thought of K10 as well, but then you could anticipate W@K9 B@J9, so I went with J9 on the one-two-three principle. What I didn't like about K10 was that white can then directly J9 which saves the J10 stone and makes the black stones in the left middle weak. If we can only eat one stone of J10/L9, it's better for black to eat J10. Uberdude picks M10 (a). Tough choice, but the important thing here is to not give white free moves to strengthen j10, as that would then make it easier for white to cut the h13 to g10 shape. For example hane at m9 (b) would give white k10 in sente. The other moves don't look good as they run into a contact fight in an area white has more stones locally. For example if j9 (c) then k10 k9 h9 h10 (only move to cut) but then k8 captures our stones: disaster. After this extend if w k10 then rather than m9 (which is very big), we can consider other moves like f13 to help the h13 g10 connection. Andy: L10 (a) to make territory while attacking. Antone: As usual I agree with Andy (we seem to think very alike). Other than that F13 (b) looks interesting, it protects our center stones and threatens to pull out our c15 stones. I'm kind of undecided between E13 and F13. E13 would be more effective, because it pulls out the two stones immediately but looks like weird shape, unfortunately this means that E13 is a very move for white. Anyway the whole thing is moot since it does not look like sente. White will just jump into our moyo. Uberdude picks L10 (a). Looks good. Largely settles the centre and makes some profit. We've got to watch out for white cutting 53 from 55 and this makes 52 considerably weaker thus helping us fight the cut. Rather than b and c I think the move there is to simply extend with our 2 stones, making w crawl on 2nd line, and bolster our stones in that area. We should also be looking for other big points on the board. celebrir: H4 (d) as a solid move which avoids a complicate battle. fractic: K4 (e), I think we should nobi on this side since White can't do much on the left. kanzenryu: D11 (g) Nobody else has the guts for a clueless tenuki. Uberdude Anyone care to share their reading of what could happen in these contact fights? If we can get away with a it looks nice, but without reading I fear it might end in disaster. jasavol1: I can't read. I just place stones at the board randomly. Uberdude picks k4 (e). extend to not help them get more stones to help centre. Andy: G10 (a). suddenly looks lonely. JeanHebert? : I agree with Andy, but let me add another move: J9 (b). celebrir: E10 (d) if you want to be more aggressive. Could be nice with our aji above. jasavol1: I wonder if we could play D13 (f). Maybe we can run away with these stones and destroy some white territory on our way? If they manage to prevent us from connecting the running stones to or some other black stones, we have an opportunity to capture the two white stones by playing at b13. Uberdude picks g10 (a). Good aggressive spirit. Attack white's reduction move and reduce w's moyo. d (e10) is not as good as it does not have a good relationship with 53 and is easier to cut. b (j9) is a rather odd contact move, don't contact to attack. d (d2) is a tricky one. As we are ignoring white's f5 it may be that white will hurt f3 in which case it will be good for us to retain the flexibility and be able to jump into the corner at c3 and sacrifice f3: d2 makes f3 heavier. e (j6) is too small. f (d13) is a reasonable idea to save those 2 stones, but locally just extending and making white crawl on the 2nd line is better, but first lets play g10 to make some support. JeanHebert? : K7 (a). Keeping our framework. kanzenryu: R17 (b) The center is grass. A vague suspicion that this move is bigger than others on the board. Maybe they will defend. Or not. Sigh. celebrir: F5 (c) is the keypoint between to moyos. There is a good continuation around d7. If white protects against this I would be happy and jump at (e). At this way the white moyo is reduced by a lot. If we have time after this because w protects against further reduction, I would take D2 in sente and build up our own moyo with something around (d). The other moves are not wrong, but I think/hope this is the right order to get them all. Andy: L10 (d) seems passive, but closes off a pretty big chunk. justification: e is not good because already destroys the moyo e is trying to build. b is too small. a is the right idea, but is too nebulous and would be better at J8. Both d and c are big, but I think d is bigger since c is slightly overconcentrated for both black and white. I think the game is very close and almost exactly even on the board with d and evenly dividing the board. W had sente to play and still has sente after d, but that is to be expected. jasavol1: H13 (e) has influence in several directions. It also threatens to make use of our two lonely stones in the upper left and split white into two gropus there. Possibly. Uberdude: Argh! This move is so hard to decide what to do. Can you make my job easier by saying why you think your move is correct and the others aren't? Also suggest a next few possible moves. For example say we play F5 (c) and white jumps further in at L10 (d) what do we do next? Invade corner at c3? Some move on left side? Feel really upset? Quite a lot of these moves white would also like to play. ThorAvaTahr: On times when a difficult decision has to be made it is necessary to count the expected results of the choices. See WuRenGo3/BlackMove53Counting. Uberdude: Yes, counting is a good idea! I was tempted to play L10 d, but as ThorAvaTahr explained I'm not sure it is enough. 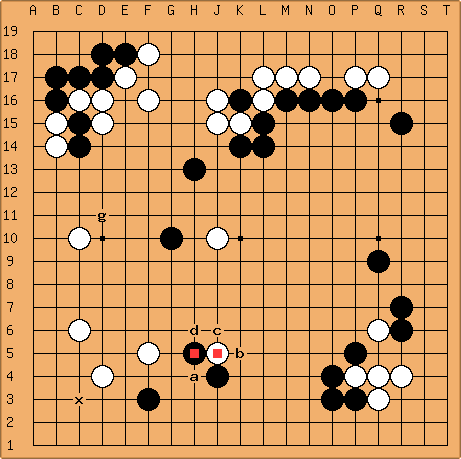 But the main reason for not playing it is kiai: to answer it is so obviously a brilliant exchange for white when they then play h13 to make lots of points and capture the c14 stones on a large scale and we can no longer even give it to white and make some points of our own with j12 as j10 is then perfectly placed. This does allow white to jump in further, but then we can attack the group as a whole with peep and g10, and save our stones at c13. We can even come back to make some points with our wall later and it's only reduced by about 10. So I pick h13 (e). r17 (b) is a nice idea to stop w getting r16 in sente, but it's gote for us and we unfortunately have to accept that mistake made back when I joined the team that we never got r17 in sente. f5 (c) is a nice idea, but as said is a little overconcentrated and I think h13 is the bigger of these 2 rough miai. k7 (a) is like L10 (d), but not as good. h13 (e) is MAD, Mutually Assured Destruction, rather than both building points, but them getting more, we both destroy each other's points. But I really don't know if it is the best move, their last move was very good. In fact I wonder if c17 was too early and we should have played L10 ourselves, I did think it looked a nice point a while ago. Andy: Ok. D18 (a). I don't know the difference between L+2 and J+1 either. Looks like no one's going to suggest the move I'd like to play of c13, so Uberdude picks a (d18). The reason I think we should extend again now is after living in the corner white can consider sacrificing b14 if we extend again later as it makes our d18 move unnecessary. Of course it's quite a big sacrifice that we'll perhaps be happy to accept. It would also be consistent with pulling out the stone, which does lose us the option of the b14 clamp (it was a hard decision for me to decide whether to extend or live directly, maybe I was wrong, I'm not strong enough to judge, however I think only extending once and then living is definitely wrong). After extending once white can capture the stones with c13 and a net which gives them a better result than simply capturing the one stone had we not extended. As to L+2 vs J+1 the L+2 is indeed better because of an endgame sequence in the J+1: d19 b19 b18 f19 c19 d18 a19 e19. Andy: D18 (a) lives in gote with an L+2 group and some aji, which was the goal all along for this invasion. fractic: If white just captures the stone we have no aji here, by extending we guarantee ourselves some aji. Uberdude picks b (c14). Agreed we should save this stone before living as then white won't have a single move to kill it. kanzenryu C14 (a) Is this consistent with the previous move? fractic: It's too early to play C14. White will capture our stone at B16. We need to defend at B17 (b) first. Antone: b threatens both a and F17, white will play F16 I guess ? fracitc? : Yes White will probably defend against F17 after which we can play a to leave aji before living in the corner. celebrir: D18/c is another possibility. JeanHebert? : I will add F17/d to the list. Uberdude picks b (b17). As fractic says we can save this stone threatening f17 to live big, so white defends that, we can then pull out or stone in atari to create bad aji (maybe quite a few times making white crawl on 2nd line in his moyo, and then live in the corner with an L+2 group. fractic: Cut at C15 (a). Andy: B16 (a) counter-hane. Getting a ponnuki by capturing is not attractive for us, and even if we end in gote by making the L+2 group in the corner here, the threat of us pulling out our eventual C15 stone will be annoying to white. Uberdude picks b16. Agree with Andy's analysis. fractic: Just continue with the joseki at D18 (a). celebrir: I guess 'a' at D17 is the obvious move. jasavol1: I added below the relevant suggestions from the last move. Please, feel free to edit or delete them as necessary. My new suggestion is the shoulder hit at D11 (b). Celebrir: You can, of course, change your suggestion any time. Antonio: I'll go with the cap at E10 (a). Andy: After white's last move, in a certain sense F5 (c) and H13 (e) have become miai, so maybe we shouldn't play either. I actually prefer (e) here, since it is more perfectly on the boundary of the two moyos, and doesn't have the overconcentration issue that (c) has, and because (e) is a better move for white than (c) is. Uberdude picks y c17. Trickly choice, a key moment to choose the direciton of play; sorry for the delay. This is the key point to take white's points here. As he is strong on both sides an approach would just lead to a weak group and w would get a lot in the corner and the side we didn't approach. If white follows the normal variation we get an alive corner group in sente and can then reduce the thickness we gave white with nice rhythm at h13. f5 (c) , as others have said this is rather overconcentrated with j4, if it were at k4 I wouldn't feel so bad about it. f6 (x) is an intersting variant on that idea aiming to grow faster but with a little weakness at f4. e6 (d) I don't like at all as white f4 will split it. q5 (z). It is big and a nice thick move, but white already has tenukid once from this area and playing again will make us fall behind globally. If it were sente that'd be a different matter, but I don't think it is (please correct me with a sequence if I'm wrong!). h13 (e). A nice move on the boundary of moyos, but let's take the corner points first. If we play here now the white move that would make me sad is c16 as this makes it hard for us to do much in the upper right quadrant. Maybe f16/e17 invasion afterwards wouldn't die but as j16 is very strong we will make a weak group and run and ruin our own moyo in the process. Also, yes we could reduce at d11 (b) as white made (IMO) a mistake by playing 3rd rather than 4th line there, but we can exploit that even more by playing there after taking the corner =). e10 (a) Too early, and with h13 and f5 open it's rather too far to build our moyo. As Andy says I fear it is too early, the 3rd line points move for 5th line reduction seems a good exchange for w to me at this stage of the game. d11 (b) Similar to e10, this could become a good move later. c17 (y) Corners, then sides, then centre =). Urgent to me as c16 very efficiently makes points. The reason white c16 is so good here is the usual downside of it is it is open territory (no 3rd line to close it) to the right side, but here white is very strong at j16 so doesn't need to come down to the 3rd line but can severely attack if not kill an invasion there. celebrir: There are a lot of good moves currently. I like 'a' as much as 'b', but 'c' seems a little bit. Therefore I suggest 'd'/E6. It looks like this easily cutable, but if W tries to cut, there should be something in the corner in sente and we can jump to 'a' after this. kanzenryu: Q5(z) take the chance to cut and weaken white. jasavol1: We may always continue pushing at K14 (b). Andy: F5 (c). I misread that S3 doesn't work anymore after . I don't think z is necessary at this time because I think we can contain white there if white connects anyway. I like a in principle because it reduces white while building the black center, but I wonder if the timing is too soon. White will reply at D12 which helps white build the side. I'd like to do the shoulder hit at D11 to make white overconcentrated on the bottom left before invading at y, but again, I'm not sure of the timing. I don't think white can close off a lot of territory with only one move, so maybe a reduction right now is not urgent. If that is so, I propose playing on the boundary of the two moyos at c. It looks a little slack to me (too close to J4), but not too bad. Uberdude picks b k14. This is pretty much sente and grows out moyo and reduces w's. I'll leave the other suggestions on as if w answers they remain valid moves after this nice exchange for us. Though feel free to suggest new moves or revise opinions =). celebrir: I guess we're not allowed to make additional suggestions after w makes it's move if we leave the old once since it would be like everybody did two suggestions and this would be a little bit unfair, wouldn't it ? ;) However, maybe we can make a fast move 37 with the old suggestions if W doesn't tennuki if nobody disagrees ? Andy Keep on with the plan I suppose. a (O3). Andy Ok, I'll kick it off. a (P5) atari! white connects in bad shape at Q4, we patch our weakness at O3 and white has to spend another move in the corner or S3 takes away all the eyespace. white can't fight a ko here since there aren't any threats. fractic: How about connecting right away with O3 (b). I'm not so sure white will just connect after a.
Uberdude picks a (p5). fractic is right white might not connect but play atari underneath or something but then we capture, get strong, and cut off 28 which builds our moyo. If we just connect and white plays o5 and we atari white can now happily sacrifice the 1 stone and our connection becomes a stupid move. Andy: Q7 (a) seems an obvious try. Due to a crosscut by white isn't very effective on this side. I was worried that white would be able to find a way to make look silly, but here the shape turns out nicely for black. White could have crosscut below with the last move, and doesn't help that much. In some tactical lines here white is spared from total devastation by favorable ladders leading to the upper left, but even in those circumstances white is fighting at a disadvantage and the potential for ladder-breakers later on the left is a big asset to black. After Q7 I expect white to P6 to avoid being shut in, upon which we can continue with Q3 to take away corner eyespace and force white to run across the board to escape. fractic: I suggest a stretch to R7 (b), it gives white less options for sabaki. Uberdude: Andy, what is your plan if white does crosscut? A: if white crosscuts at R7, atari with R8. white can get some forcing moves, but nothing very helpful. White crosscut at O3 is more interesting, but black can atari at N3 and the weakness of makes it difficult for white to gain a lot of ground. If were stronger, this crosscut would be more effective. celebrir: 'd' to give more options and punish that they ignored the hane. jasavol1: I'll give Q4 'e' as an option, then. Uberdude picks b (r7). We are attacking and as fractic says this reduces white's options for sabaki. The problem I see with the hane is white crosscuts and sacrifices 2 stones to get r5 in sente. Then after extending at p5 we play q3 and white can now block at r3 to make a base in the corner. Without the 28 exchange white would make a bamboo joint at r5 and we'd take the profit and base in the corner. Of course maybe it is slack and we should hane at q7, Go is hard. The other moves leave us with too many weaknesses to forcibly attack IMO. fractic: Q4 (b), aiming to start a fight so we can solidify our bottom territory and chase white. Uberdude: So what after q4 q5 q3 r5? fractic: oh yeah, I got a little confused. Andy: (b) takes the corner, but white will play (and sacrifice) Q3 to get lots of forcing moves on the outside to destroy the bottom. I vote (a). A response is required and extending to P3 is passive. If we Q3 ourselves now, white can Q6. White touched the Q3 stone so it needs help urgently. celebrir: Q5 / 'b' might be a option as well. It develops the bottom and helps to limit what w gets out of the deal. Andy: I see no reason not to make the severest pincer at (a). White will come out and we chase while strengthening the bottom. Both (b) and (c) contain white, but white will live easily and give us one less target. Antone: wouldn't that be driving white into our moyo ? If we just seal him in we gain thickness outside and get the same points safely. Uberdude picks a (r6). The only move IMO. It is a severe pincer that stops white making a base on the side and builds territory for us there. This means white will be forced to live in the corner or run out, both of which should allow us to develop the lower side. fractic: Time to make an extension. I suggest R9 (a). Andy: 'd' / Q5 to continue developing the bottom. I don't like any of the moves in the middle with the bottom right corner so open. I'd rather white take one of those middle points and then get smashed up against the black wall. antone: you are stronger than me, but the wall looks really weak to me, it has no real eyespace and cannot make any without an extension. If we push white against it wouldn't we be killing our own wall ? jasavol1: Though we may not want to, I think we are able to continue pushing further with K14 (f) since that seems to be sente. Uberdude picks q9 (c). This was a really tough choice between q9 (c) and q5 (d). In the end I went for extending from the wall as I don't think after q5 the white group invading the right side will be under much pressure as the gap is so wide. We really want white to make a weak group that we can attack severely, taking profit in the process. I didn't like the 3rd line moves as we are making a big moyo and the shoulder hits make the reduction too easy for white. Another move I considered was q6, similar to Andy's q5 but even bigger. jasavol1's suggestion of k14 is an important one to note. As white played atari there rather than extending we have that forcing move on the boundary of the moyos, though there is a chance white tenukis and splits the right side, we capture, white plays again on right side and our nice moyo has gone. We should try to get it soon though. antone: so you are planning something like the following diagram where w plays around R9 and b attacks at R7. but then would you rather have at Q5 or R4 ? Would it not be better to play R7 now and then decide which enclosure is best ? A: yes, not this exact sequence (particularly not the shoulder hit of ), but this is the idea. White will live small in gote, but black gets sufficient influence in the middle to both consolidate the bottom and have an easy time destroying the left. In the course of attacking a white invasion, black's wall extends across the middle of the board so black's stones at the top have few worries. The proverb says don't use thickness to make territory, which is what a small black extension in the middle tries to do, I worry. Black certainly didn't make territory with the wall on the top so far in the game, so I hope those stones count as thickness (if they don't count as thickness, black has already lost this game so we might as play as if they do count). Fractic, what if white q8 after r9? Celebir, what if r7 or r4 after q9? Antone, what if q9 after r8? Uberdude picks q9 (c). This was a really tough choice between q9 (c) and q5 (d). In the end I went for extending from the wall as I don't think after q5 the white group invading the right side will be under much pressure as the gap is so wide. We really want white to make a weak group that we can attack severly, taking profit in the process. I didn't like the 3rd line moves as we are making a big moyo and the shoulder hits make the reduction too easy for white. Another move I considered was q6, similar to Andy's q5 but even bigger. Uberdude I've now joined as a 2nd captain for black. May I encourage soldiers to present more in-depth reasoning for their moves and also to critique others'. This will clarify your thoughts, help others to learn, and makes it harder for the captains to not play good moves that you have explained well. So explain that kanzenryu's suggestion of k16 is bad as if black later pushes at o17 and cuts at p18 white can atari at q18 rather than connecting at n18. This means black can't get r17 in sente. White can't atari at q18 if black plays this sequence before the k16 atari forces white to connect and get more liberties at l17 as white would collapse with k15 o17 p18 q18 n18 o19 l17 double atari. I would estimate the r17 exchange is worth about 5-10 points. So if we have k15 o17 o18 p18 n18 r17 q18 k16 l17 l14 j15 black gets sente, as is likely to happen if we now have l14 j15. The difference is black has exchanged r17 for q18, whereas now r17 would be answered by q16 q15 r16 and die. The disadvantage of playing o17 is that you need to consider the trade k15 o17 p18 n18 r17 l14 m15 k16 q18 w sente. It should also be mentioned that it loses a liberty. It is also possible for black to put in o17 and p18 and then omit r17 for now but immediately play k16, as p18 has probed and already got the beneficial exchange desired. It is quite likely it will be black who does get to r17 soon anyway. So it becomes a question of judgement of whether black is content to take this trade, which does indeed see white get into the centre which is where black's strategy has been focused. I would say he must be, as to play k16 directly is to get a result that is clearly inferior to joseki by a significant amount. A cut still remains at k14 too (yes w could connect at k14 not k16 but then there is very bad aji at k16 so that's ok). Also in go it is important to be flexible, and taking a significant local loss for perceived global benefit requires careful consideration. On this board the right side is still very wide open so it is unclear to me that black will make up there the loss he has incurred in the corner. jasavol1: J16 (b) might be possible, too, though maybe difficult. Uberdude chooses L14 (a). Best to be consistent with the previous move, even if it did result in a local loss. Go is a long game. Good to see J16 suggested, but I think it does get too difficult as the L14 atari forces black to make bad shape, then white plays j15. Black really needs to hane at h15 but then white cuts and black is in big trouble (white has the h17 g16 j17 h14 ladder to make it easy). If d16 was black maybe it would be different. kanzenryu: K16 (a) everything else looks like surrender. 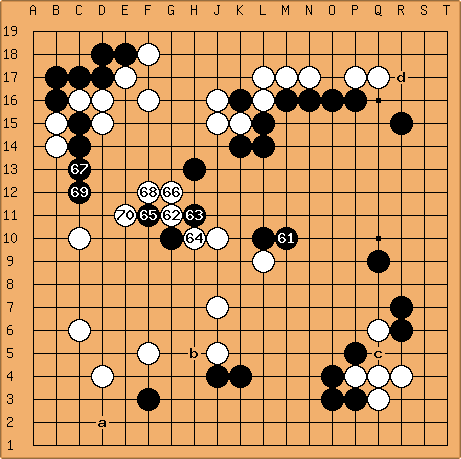 DragonYao: O17 (b) is the joseki continuation. We exploit white's multiple cuts with some nice forcing moves. Next P18, R17, then back to K16. jasavol1: I agree with Dragon at O17 (b). 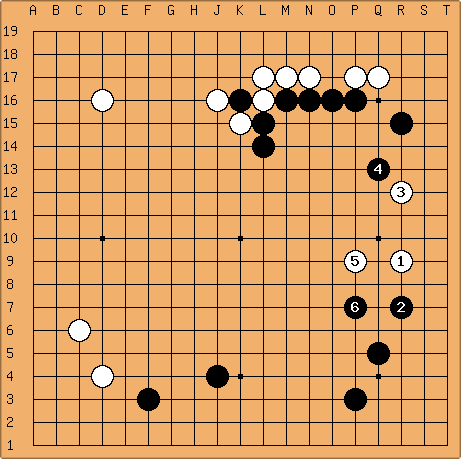 isd: I like kanzenryu's idea here, this move at (b) still looks vulgar to me. ThorAvaTahr: Did you even look at DragonYao's suggestion? (35PointLowApproachPress) O17, P18 and R17 should IMHO definitely have been played before K16. Uberdude Agreed k16 should o17 first. isd: Inflated ego - I don't see where that comes from? I am the only dan player on the black team, sorry but that's not my fault. ThorAvaTahr: I suggest to keep the discussion polite. I am sorry if the tone of my remark was too strong. I respect isd's choice, however I felt that the choice of ignoring DragonYao's suggestion twice, was insufficiently supported by the argument of 'vulgar style'. 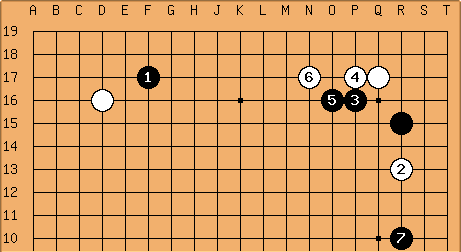 That line of play is joseki, as suggested by DragonYao, which IMO gives indication that that line is not necessarily vulgar. jasavol1: L15 (b) is also possible. We can return to a after that, at least according to 35PointLowApproachPress. kanzenryu: R17 (c) Increase the pressure on the group by pushing into the corner. If they play at (a) it's just a slow move and we can take profit elsewhere. kanzenryu: I am obsessed after the last game! I figure it's worth fighting for. I am choosing (b) L15, it looks to be the only consistent move given what we have played so far. (c) is probably ok too, (a) looks really vulgar. 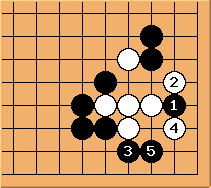 DragonYao: (a) is not as vulgar as you think, it is joseki because of white's weaknesses. kanzenryu: L15 (a) Is this how you handle this kind of thing? celebrir: b is a joseki move. jasavol1: I agree with M16 (b). I would just like to point out that it's better to leave coordinates along with the letter when you give suggestions. jasavol1: To get some more suggestions I could give Q10 (c), though. Antone: how about Q5, gives us an enormous corner or good thickness if white invades, works with our stones on the top and on the left. If white splits we can push him across the side, profit by closing the corner and can still play R17 if the top gets in trouble. isd: ok, I think the consistent strategic move is (b) creating good potential. (c) leaves the stones on top rather exposed, and I am not sure what the choice of (a) does for us on a large scale. DragonYao: Agreed, it is the only real move in this situation, if we played the press, then we basically have to follow up. celebrir Agreed. I guess the next four moves are forced if W doesn't do something unexpected. jasavol1: I agree with all the others. antone: wow! that's great, I've started to avoid the press since it tends to always blow up in my face but that looks like a very nice move for these kind of situations where the framework is simply too big to hope to keep it. jasavol1: I'll suggest a two-space high pincer at N16 (a). celebrir: (c) would be my move. There is a good chance, that we will get sente to play around the q10 hoshi. antone? : I withdraw my suggestion (was R11) and submit 'b' at F17. Let's see what white does. If they play like they did on the bottom side then a pincer on the top right looks interesting. kanzenryu: R4 (d) it's starting to look to me like we might not get a corner again, so get one while the getting's good. DragonYao: kanzenryu, not getting a corner is really a non-issue... Playing R4 is losing the initiative, we've already played enough on the bottom. For variety, I will suggest the one space pincer M17 (e), trying to settle on both sides. antone? : Dragonyao, you said one space pincer, did you mean O17 ? Region : I like e because it has a great play in both directions. isd: I'm going to chose (c). I think it works well with the stones we have below. I was quite tempted to enter into the Taisha with (a) - but it's very complicated, so I'm not sure it's a good idea for this sort of game. antone: Isd: I know it must be boring, but could we have a little more feedback on the non selected moves ? Even something very basic like "wrong direction" or "too small" or even "it's ok but this other move is more my style". It would help us poor soldiers muchly. isd: ok :) (d) looks very slow to me, it will allow our top to be attacked. If white wants to fight he might pincer our stone, but that's still ok for us, we get to press and then attack the pincer stone while building the bottom. celebrir I agree with b because the Kobayashi Opening expects at Q3, so b seems to be the correct distance from the cornerstone and doesn't allow a as easy invasion as J4 would. But because I doesn't like it in general because it is overconcentrated easily by E3 I suggest c as a option. fractic: I like b but I'll add J3 (d) as another option. jasavol1: I like b (J4) also. isd: I was quite tempted to pick a but in the end I plumped for b since it is quite a nice Kobayashi-esque move. I don't much like being pincered after a.
celebrir But at the game diagram you chosec Oo I'll tell them to wait there as well. kanzenryu: Q17 (a) One more corner than we got in the last game. DragonYao: F3 (b) Don't need to be so wary of territory... we'll make ours eventually. I like approaching instead. Antone: I agree with the approach at b, if not that then making a shimari would be my second choice, but if so I think c at R4 is better than a, because when white approaches the top we can press and build a nice wall that works with the shimari. fractic: P16 (d) a more ambitious shimari. Antone: crab eyes! please let us play crab eyes! (a) at C15. kanzenryu: C16 (b) Start a shimari with the open side facing our existing stone. DragonYao: D16 (c) to continue the influence orientated opening. Not sure how effective crabeyes are. Hoshi also looks forward to making a shimari in the top right later. fractic: Q4 (d) the other corner. isd: It seems clear to me that e is the prettiest move. 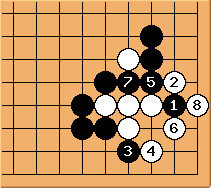 kanzenryu: R16 (a) slightly more likely to get a corner than Q16. Sec? : I'm currently playing around with 54 as an opening, so I'm suggesting b.
fractic: Let's play tengen (d). DragonYao: Well, I guess I'll suggest mokuhazushi then, (e). isd: I like your thinking DragonYao, we'll go with that one. Antone: and so it begins! b) or c) extend. Logical shape for white, but difficult since white is surrounded here and gets heavy. White can make a small group that survives in the center, but will lose the bottom and black will have an easy time invading the left. White rescues , but in gote and at terrible cost on the bottom. In summary, I think white is at a disadvantage here and does best to complicate with the crosscut, but black is going to get a good result, so playing here for is ok.